Win up to $58,000+ in prizes! This contest is over and the winners are being selected. Winners will be announced on October 1, 2016. Thank you for participating! Winners were selected and notified. The big announcement will be made at World Maker Faire in NYC - October 1st 2016. Calling all Makers! Make: has partnered with GE and Hackster.io to bring you this really cool challenge, and we’re excited to offer you an invitation to participate. The future of lighting isn’t just about illumination, it’s about intelligence. Because the average home has 45 light sockets with unobstructed vantage points and a power source, lighting is uniquely positioned to be the “glue” of the smart home. When your lightbulbs go beyond simply being on or off to become Bluetooth®-enabled connectivity points — well, the possibilities come to light, don’t they? The winning designer will be awarded $25,000, and have their idea developed, manufactured and taken to market by the team at GE, to become an extension of the C by GE product family. The first place winner and two runners-up will receive an all-expense paid trip to NYC to be showcased at the World Maker Faire New York in October 2016! Join us for a chat with the GE Team! To help answer any questions you may have about the Lights for Life Challenge, we're hosting Slack Sessions where you can openly chat with the GE team. You will also be able to view videos and important reference documents like rules, tips to get you started, and more! To request an invite to our Slack Channel, please fill out this form. Our next session will take place on June 23, 7 pm EST. You'll be chatting with Jeff Patton, GM Connected Home Product Management and Tom Stimac, Chief Innovation Manager. We can’t wait to hear your design challenge questions! Show us your bright idea! You’ll be working with C by GE, the cutting-edge leader in affordable, Bluetooth®-enabled LED bulbs. The C Life bulb gives you an easy way to illuminate your intelligent home by day, while C Sleep, with its three distinct settings, makes for the perfect bedroom light. 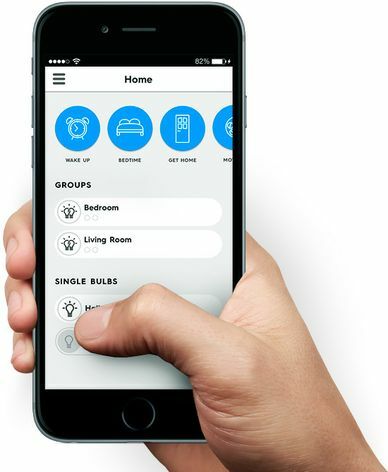 GE is developing an app too, allowing people to program C by GE to interact with smart devices throughout the home. Start by creating a free account on Hackster (or sign in if you’re a member). Register for the contest by clicking "Register as a participant”. Create your project by clicking on "Add my Project" on this contest page and filling out the template. Describe your project: What are you creating? What does it do? Why does it matter? Submit your project by clicking on "Submit to Contest" once your project write-up is complete. Design a beautiful and smart light fixture that responds to you intuitively. Deliver something that improves the way people live their lives – simplify life. Consider use of sensors: motion, temperature, etc. Consider application of a service. Note: GE will transform the winning submission into a finished product. GE would like to bring your idea to market while assuring that all projects submissions are private and safe. When you submit your project to Hackster it will be hidden until we pick and unveil the top 3 winners. Keep perfecting your project as much as needed — you are the only one who can see it. We are giving away tens of thousands of dollars in prizes to the top 3 projects! Our judges will pick the best qualifying 3 projects based on the judging criteria outlined in the rules section. $25,000 cash prize, plus up to $5,000 in travel and accommodation to present at World Maker Faire NYC. $12,500 cash prize, plus up to $5,000 in travel and accommodation to present at World Maker Faire NYC. $6,250 cash prize, plus up to $5,000 in travel and accommodation to present at World Maker Faire NYC.